The value of a rare or limited bottling is greatly enhanced by a very special container that may be kept long after the contents have been drunk, if indeed they ever are. 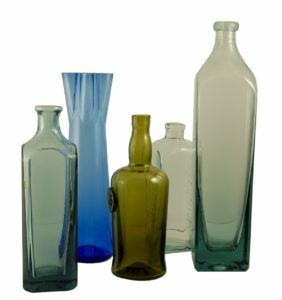 Although we do not manufacture bottles in large quantities, exclusive drinks companies wanting to market a premium product use Nazeing Glass to produce small runs of prestige hand made bottles. Other examples of Nazeing’s special manufacturing ability is the Thames Water / Mayor of London “London on Tap” campaign, started in 2009 to raise public awareness of tap water and encourage them to ask for it in London’s bars and restaurants. Thousands of the unique “Tap Top” design water carafe were needed for the launch events in several different colours and Nazeing worked with Thames Water and winning designer Neil Barron to make this happen.